Dr. Perez is one of the local and international professionals across the world who fulfilled the criteria under Royal Institution Singapore and received conferment of the titles of Doctor Fellow, Senior Fellow, Fellow, Senior Member, and Member of Royal Institution, Singapore. Each awardee received certificate and medallion that signifies their excellency on their professional lines. Three of the esteemed titles were conferred to Dr. Perez during the ceremony—the Honorary Fellow title which signifies a lifetime honor in recognition of his contributions and achievements; the Doctor Fellow title for being the highest and most distinguished honorific member; and lastly, the Doctor Fellow of the Royal Institution of Educators title, the most distinguished honorific membership title for an educator. Moreover, Dr. Perez was joined by the University of Batangas Vice President for Academic Affairs, Dr. Abegayle Machelle Perez-Chua, and the Chief of Staff, Ms. Sharlene Perico in receiving certificate of recognition given to University of Batangas for its invaluable contribution in supporting the mission, vision, and goals of the Royal Institution Pte. Ltd., Singapore, thereby enabling deserving individuals to achieve quality and relevant training and development by transporting them to be a part and parcel of the global work force. 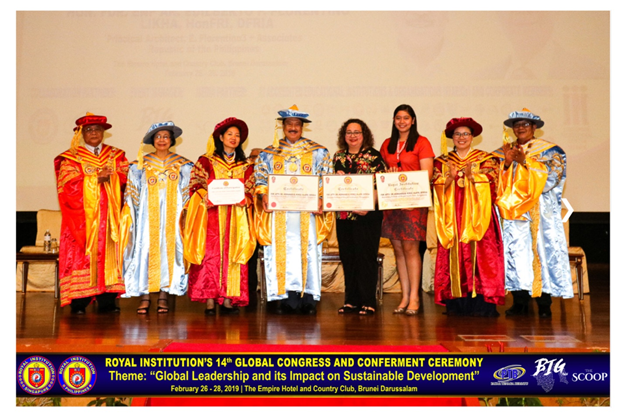 On to the 14th wave of GCCC, Royal Institution Singapore continued its legacy of being a global, professional, multidisciplinary and accrediting organization of more than 300 royal institutions of various disciplines and professions. This year’s theme, “Global Leadership and its Impact on Sustainable Development,” encompassed the momentous ceremony as it aims to develop collaboration with different trades to serve a premiere platform for smarter and more effective global network linking education, business, commerce and industries; facilitating perpetual learning for more opportunities, benefits, privileges, better lifestyles due recognition and excellence.